Calling all Cherry Lovers!!!! Hi! 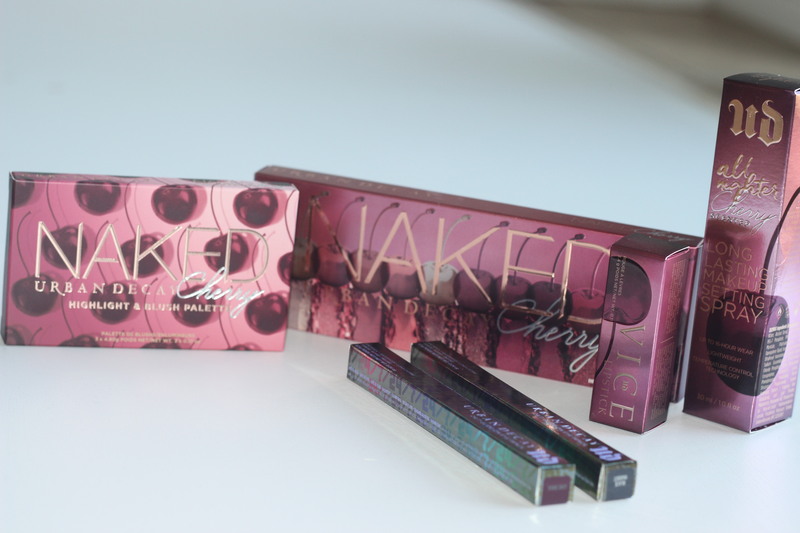 I am so excited to share with you my thoughts on the New Naked Cherry line by Urban Decay. First off let’s just say the name is a winner! Cherries are adorable and yummy. I was able to attend an Urban Decay event that was recently thrown out in the LA area at Goya Studios and I took home a huge cherry! haha. I first I was wondering why everyone was leaving with decor props and then I noticed some girl opening her cherry and the makeup was in there!! My feet were in so much pain in the heels I chose to wear that night (EYE ROLL) but I knew I had to get my hands on the naked cherry line so I ran back and got myself my cherry lol. At the bottom of this post I will some insta videos I took of the event. pssst..Snoop Dogg was there! They really know how to throw a launch party! Okay okay let’s get into the line! Line is available for purchase on 10/5 online or in stores 10/26. Let’s start with the Naked Cherry eyeshadow palette shall we? Cute packaging with 12 gorgeous shades! I mean look at the metallic burgundy called Drunk Dial! It is so beautiful. The shades range from ivory, rose gold to a black cherry. Oh la la. It is available online 10/05 and in stores 10/26. Now for the lipstick I am so excited with this shade “Cherry” it is so perfect for fall with either a subtle eye look or dramatic. It will work with both. It has a nice satin finish and no gloss is needed. The shade is a very deep berry wine. The NAKED cherry blush highlighter and blush palette is a 3 shade palette that has beautiful highlighters and blush. The shades are perfect for every day use and perfect size to throw in your bag. I could not wait to spray the All nighter cherry scented setting spray! Let me tell you..it smells delicious and I don’t think any other setting spray is going to be able to compete. You need this! Yes you do! I love the 24/7 glide on eyeliners. Always been a fan of urban decays Zero but now I have my hands on Love Drug and for sure using it as lipliner! oh yeaaaah. There you have it! The beautiful NAKED Cherry line by Urban Decay! What are you most excited about? Now for the not so high quality Insta videos..lol hope you enjoy them. (warning the first video you may want to lower your volume..that’s when snoop makes his appearance) lol.